There is an interesting story of Lord Shiva reminding Hanuman the power of chanting Rama Nama or Lord Ram’s name. Hanuman was roaming around the world with the horse that was part of the Ashwametha Yagna being conducted by Lord Ram. Anyone who does not accept the royal authority of Lord Ram can stop the horse and challenge Ram’s army. A fierce and valiant king named Veeramani stopped the horse and challenged the army of Lord Ram. Veeramani was an ardent devotee of Lord Shiva. This Shiva Bhakta defeated all the warriors in the army of Lord Ram except Hanuman. Hanuman easily defeated the army of Veeramani. Veeramani then sought the help of Lord Shiva and He came to rescue of his devotee. 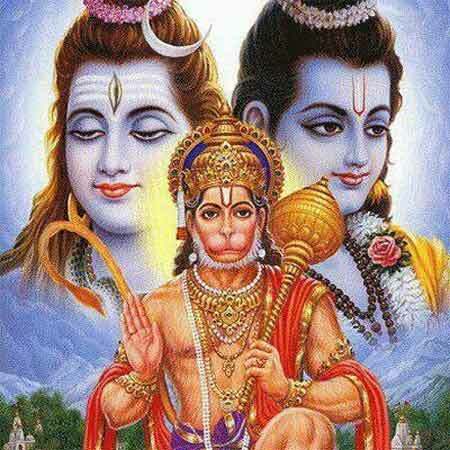 But soon Shiva realized that he cannot defeat Hanuman as Hanuman was always chanting the name of Lord Ram. Shiva then made Veeramani understand the glory of Lord Ram and asked him to accept his royal authority. Then turning to Hanuman, Shiva asked what he wanted as boon for being such a loyal devotee of Lord Ram. Hanuman asked for Sanjeevani herb to get back to life all the people that died in the battle. Hanuman felt ashamed of his ignorance and soon by uttering the name of Rama awakened all the dead and wounded and brought them back to their original condition. It is believed that a person gets rid of all physical and mental troubles and evils by chanting the name of Ram.